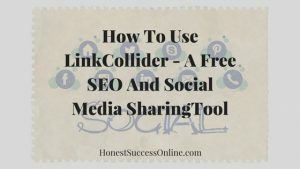 In my previous posts, I have talked a lot about Linkcollider, a free online SEO, and social media sharing tool. It is important to have a strong on page search engine optimization but also the social side of things play more and more an essential role. Through social media, you will build a brand, get more exposure, more traffic as a result and you can, in general, create a bit of a buzz around your online business. I have talked about How you can promote your website for free, and Linkcollider can help you in this regard as well. My post will show you how to use Linkcollider, how it works and how it can benefit you. 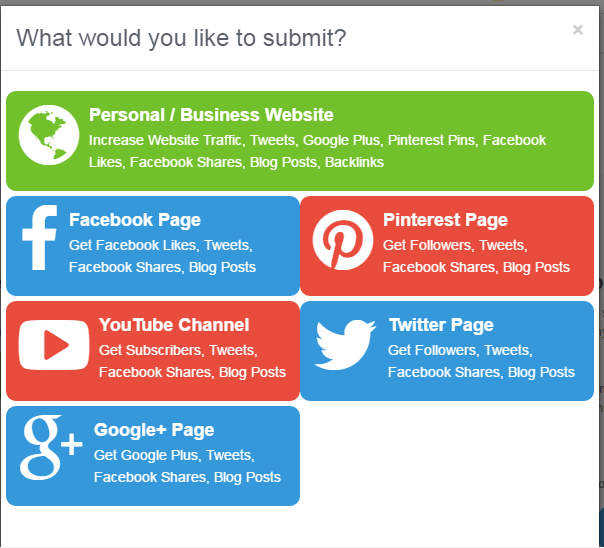 Linkcollider offers a platform for people to share their websites, FB business pages, Pinterest Page, YouTube Channel, Google Plus page and Twitter account. You can set up an account for free, here is the link. Included in the free account are three websites you can submit. As an example, you could submit a website, as a second option a YouTube channel and thirdly a Pinterest Page. It is up to what you would like to focus on. It could be to gain more Pinterest Followers, or you’d like to get subscribers for your YouTube channel. If you need more than three websites, you would need to upgrade to a paid membership which includes up to 20 websites. The system of getting shares, likes, subscribers, etc. works as follows: you can collect tokens by liking, subscribing and sharing and in return, you can use these tokens to get the same for your websites you have submitted. Here is a screenshot of my dashboard at Linkcollider and I am going to explain it step-b-step. For a Twitter account, Pinterest page, etc. the options would be a bit different. Click on the section ‘Collect Tokens, ‘and a variety of choices will pop up. It will show you, e.g., Google Plus, Facebook shares, YouTube subscriptions and much more. You simply click on an option and choose which websites you want to support. As an exchange, you will receive your tokens. If you don’t have time to collect tokens, you can buy them as well. For as little as $5 you will get 10000 tokens. I think that is quite a lot and will get you going for a few days. Here is a screenshot of what I got for my tokens. 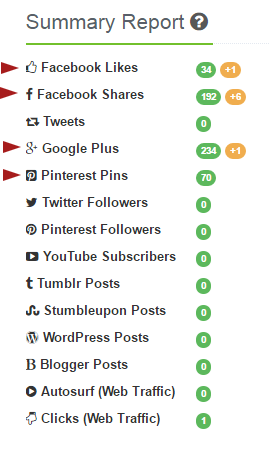 I focused mainly on Facebook likes, FB shares, Google Plus and Pinterest Pins for my three websites. The screenshot shows the result I got after one week, and I am happy with it. 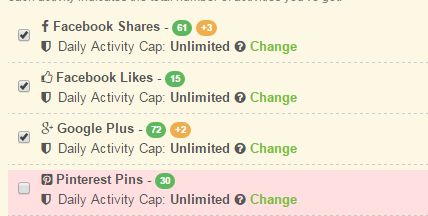 It takes a long time to get Facebook shares and Google Plus as well. So these numbers will give your site a good boost in the Search Engines. In the future, I could even mix it up a bit e.g.’only focus on one website plus their Facebook business and Pinterest page. It is up to you how you want to use it. You can always adjust your preferences. As a sidenote: I wouldn’t use the Autosurf (Web Traffic) or Clicks (Web Traffic) at all. It only messes up Google Analytics because it is not the targeted traffic you would aim for. But that is my opinion and can be different for somebody else. The list of SEO tools is quite extensive and includes a Backlink Generator, Keyword Tool, Drop my link, Article Rewriter, HTML for SEO and a few more. I haven’t used any of them and don’t know how much use they are for getting your page ranked higher. I’d recommend to focus on the social media sharing side and check how it impacts your reach, branding, as well as building and increasing your website authority. When you create a free account (by the way, you don’t even need to provide your credit card details) you get automatically assigned an affiliate link which you can share on social media, on your websites and so on. 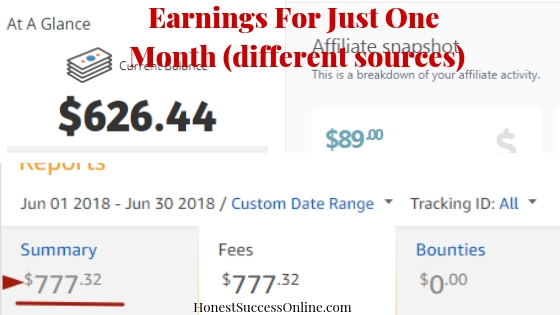 You will find your affiliate link under ‘Earn Money’ on your dashboard. If a person signs up through your link and becomes a paid member, you’ll get 20% of the sale. Why not? I definitely recommend Linkcollider. As a free member, you get to spend no more than 2000 tokens in a 24-hour time frame. That is pretty sufficient in my opinion. You can also decide how much you are going “to pay” for activities like shares and pins etc to other members. For instance, if someone’s share my pages they will earn 20 tokens that means I “pay” 20 tokens from my account. I can earn as many tokens as I want per day. It depends on how much time I can spend each day on Linkcollider. I have chosen the lazy way and bought tokens for only $5. So it is up to you if you want to spend money or spend more time to earn tokens. Win-win for everyone; more shares, more likes, more pins, more subscribers ⇒Happy days! I can’t see any Cons so far. It is easy to use, and it’s free to join. So there are no strings attached. As mentioned before, I can’t comment on the SEO tools and if they are effective or useful. I hear a lot that backlinks are not relevant for rankings at all unless they come from an authority website. I’d rather concentrate on creating valuable content and social media presence. Linkcollider is a cool SEO and social media sharing tool which seems to work. It is free to join and works on the simple system of exchanging tokens for social actions like Facebook shares, Tweets, Google Plus, and other activities. I know that social media presence will increase traffic to your website. I see a lot of visitors coming through Facebook and Pinterest which are my main social media platforms. So, I recommend using Linkcollider because it will help you grow faster regarding social media presence. Click on the banner below and create your free account today. 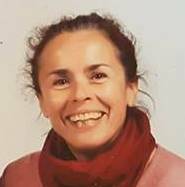 Please let me know what you think of this free SEO tool. Hi there Jaseem, I haven’t heard about this tool before, so thanks a bunch for sharing. I will be checking it out. Thanks for taking the time to comment. I’ve used this tool and my seo ranking has increased . Thanks you so much. Do check my site lifetweaker dot net. Hi Ashutosh, that is great news. I am glad linkcollider helped you to improve your SEO ranking. I will check out your site. Thank you! This is useful! Works for me!